Neither a comedy, nor a serious crime-drama, War Dogs struggles to find its identity. It's an entertaining movie, and will make you think about the reality behind the not-too-distant history. Overall, it's worth the price of admission. War Dogs is based on the true story of two nobodies in their 20s who end up winning a 300 million dollar contract with the government. Of course this was out of their depths, but surprisingly they managed to somewhat handle the situation. This being a true story, you should expect some measure of comeuppance for the lead characters at the end. The director of the movie, Todd Phillips, has made a reputation with comedies such as the Hangover trilogy (2009-13), Old School (2003) and Road Trip (2000). His directorial skills transferred to this movie as well, and made the pacing and visuals of the movie pretty good. I don't know if it's the director or the screenwriters who should be blamed, but War Dogs suffers from an identity crisis. It is not a comedy in a true sense - contrary to what the trailers will lead you to believe. It is not a serious drama with a strong social commentary either. It's just somewhere in between the two. There are a few chuckles throughout the movie - all owed to Jonah Hill's great performance. You'll also leave the movie theatre thinking about the ridiculousness of government workings and how these two schmucks ended up handling a 300-million dollar contract. If this movie was made by someone like Oliver Stone, I'm quite sure the tone of the movie would lean more towards the latter (i.e., crime drama) and would have had a much stronger effect on the audience. Speaking of Oliver Stone, War Dogs makes abundant references to one of Stone's earlier works. I'm talking about Scarface (directed by Brian DePalma with a screenplay by Oliver Stone). 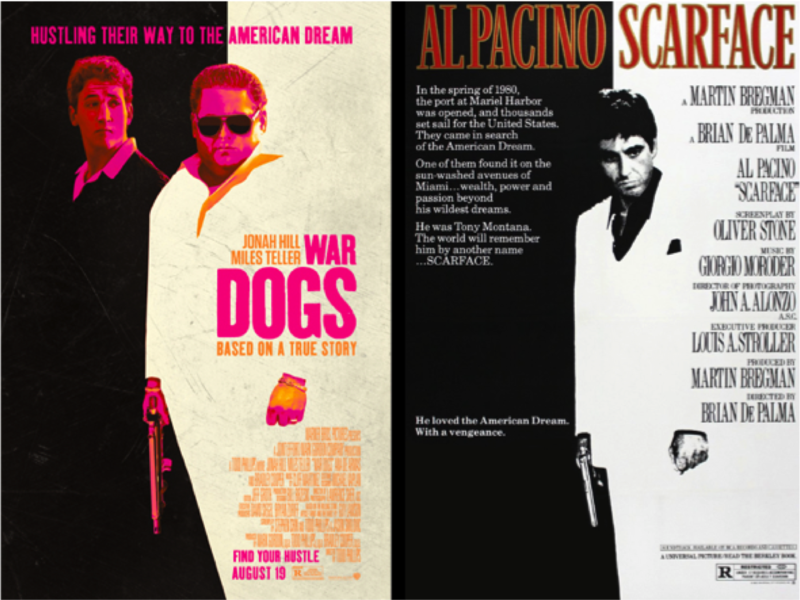 From the poster of the movie, to set designs and mannerisms, War Dogs strives to be like Scarface. Of course this causes some laughs and maybe shows how out of depth the characters are, as they are just two kids trying to act like Tony Montana. I briefly mentioned how great Jonah Hill's performance was. He was the only comedic factor about the movie, and at the same time he managed to be menacing when needed. Miles Teller on the other hand, played the same obnoxious person that he has played in Whiplash (2014) and Fantastic Four (2015). Bradley Cooper also had a cameo role that could have been played by almost any A-list celebrity. His presence in a non-Hangover Todd Phillips movie was appreciated though. Overall, War Dogs is an entertaining movie and even just for the sake of it's real-life true story, it deserves to be seen. I'd give it 7.5/10.